In the grand scheme of things, regardless of how many times you read Disney food menus, and think you know what to expect...things are never what you think they'll be. For our amazing Disneyland trip last year we pulled out all the stops. We had reservations for each day of our trip...and Adam even made a food planning chart, so that we wouldn't forget anything. Yikes, we were anxious about food. One restaurant that we had the most apprehension about was Cafe Orleans in the heart of Disneyland's New Orleans Square. Not because the menu was off putting to us, in fact it looked quite promising, but because it had been hyped up so much. By the time we actually got around to eating here our expectations were even lower. You see, Cafe Orleans is right next door to French Market, which is one of the BEST Disney counter service restaurants you are likely to try. So why wouldn't we just eat there for the fourth time?? For the sake of the blog, thats why. The atmosphere of Cafe Orleans is entirely delightful. We were here at lunch time, and were asked to queue up outside of the entrance, in a side alley in New Orleans Square. I don't believe there is any waiting area of note. In short order the hostess began seating the hungry gathering of folks. Without asking a seating preference we were walked through the very dim restaurant to an outdoor table, which we preferred. You see how I don't remember the details of the interior of the restaurant? Because it was quite unremarkable. Good thing is, the majority of the seating is outside along the New Orleans Square/Frontierland promenade. Here you can people watch, catch strolling performers, and hear music from the nearby French Market. You see, this is a restaurant where you are expected to sit outside and enjoy DISNEYLAND. As far as food is concerned, you're going to hear another familiar adjective: adequate. With the amount of hype built up around Disneyland's famous monte cristo sandwiches the odds of us being satiated was pretty slim. (albeit, we had the cheese version, as opposed to the traditional version...) These sandwiches are somewhat legendary in the realm of theme park food, and came with its own fan club of folks urging us to try them. So? meh. Touted as swiss, mozzarella, and double creme brie fried in a light batter served with berry puree and dusted with powdered sugar...this sandwich was alright, but nothing to write home about. I am a serious proponent of salty and sweet combinations...but this sandwich lacked gravitas. There was a flavor element missing. Honestly, if they had swapped out one of the mild cheeses for a sharper cheese this might have been a home run, but for the sake of this blog post it was super underwhelming. And dont let the description fool you. The "light batter" referred to in the description was actually a fried doughnut. This was basically mild cheese stuffed into a doughnut with a side of jelly. The best part of this dish was the delicious California grapes that came on the side. Seriously the best grapes I've ever had. In addition to the monte cristo sandwich, there is another cult favorite at this restaurant as well! The pomme frites! Described as traditional french fried potatoes tossed with parmesan cheese, garlic, and parsley, served with cajun spicy remoulade sauce. I had seriously high hopes for these, seeing as they were recommended so highly. Even The Unofficial Guide said that they were worth the price of admission. Well...um....yeah, they were good. Not THAT good, but again they were adequate. The flavor profile could be built using the description available and your imagination. My main complaint about these is the sauce. Describing the remoulade as "spicy" is a crime against nature. Blah. 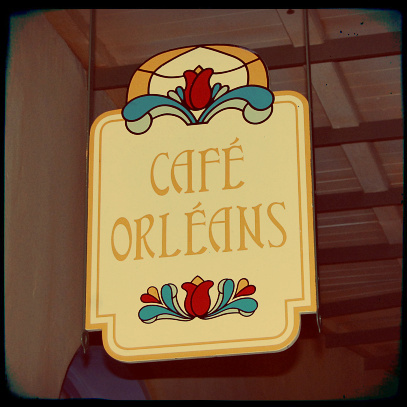 I dont mean to be so harsh on poor Cafe Orleans. The food was entirely acceptable, and we really loved the atmosphere. I'm sure for most people this is a step up from what they usually associate with as theme park food. But I (and you, probably) know that Disney can do SO MUCH BETTER. There seemed to be some element missing from each dish, and a little revamp could push this restaurant from forgettable to outstanding. We had same experience on another trip at that place. Your review is spot on. Didn't go back there. We ate in almost the same outside spot with some friends. They liked their food. I don't eat doughnuts or fries and I of course thought beignets were the same darn thing. I did try one though and I did eat the whole thing with a puss on. We eat at Blue Bayou this time and waited a long time even with a reservation. Service was dead slow. Food nothing special. Atmosphere of course is really great. We still like Rancho del Zocalo because they have really cold custom salads. I get a mickey head and a dole whip and some wine and cocktails at Napa Rose or the new Cathay Circle and I'm done treat wise. I'm too old for theme park food now and no matter how well Disney tries to do it, and they do, I gotta eat like 90% healthy when I'm there. Its hard. I had the same experience! I was SO excited for the fries. They came out lukewarm and overly salty. Major disappointment.